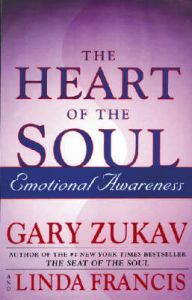 With the rare combination of profound psychological insight and deep spirituality that has already drawn millions of readers to his two great national bestsellers, The Seat of the Soul and Soul Stories, prizewinning author Gary Zukav now joins with his spiritual partner Linda Francis to help us develop a new emotional awareness that is central to our spiritual development.In The Seat of the Soul, Zukav brilliantly set forth his fundamental concepts, explaining how the expansion of human perception beyond the five senses leads to a new understanding of power as the alignment of the personality with the soul -- "authentic power." In Soul Stories, he showed how such concepts as harmony, cooperation, sharing, and reverence for Life express themselves in other people's lives. Now, in The Heart of the Soul, he and Francis take the next major step forward in showing us the importance of emotional awareness in applying these concepts to our own daily lives.